Choosing a preschool for your child is an important decision. Why choose Beverly Montessori School for your child? Beverly Montessori School’s method of education, developed by Dr. Maria Montessori in 1906, is a child-centered educational approach that is based on Dr. Montessori’s research and experience with young children. She believed that the goal of the educational process was to cultivate a child’s natural desire to learn. It is a view of the child as one who is naturally eager for knowledge and capable of initiating learning in a supportive, thoughtfully prepared learning environment. Our approach values the human spirit and the development of the whole child—physical, social, emotional, and cognitive. There are components necessary for a program to be considered an authentic Montessori learning environment. Mixed-Aged Groupings — Montessori classrooms are structured in three year age groups. 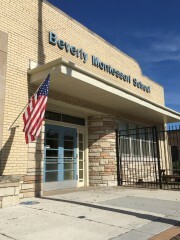 At Beverly Montessori, children ages 3-6 years-old work together in a family-like community in the classrooms. Friendships occur between all ages. Younger children learn through observation and look up to the older children, while older children gain the experience of role-modeling, leading, and teaching. Authentic Montessori Materials – Dr. Montessori created specific learning materials and lessons to enable children to progress from the concrete to the abstract. Each classroom has these materials readily available for the children. Many of the materials have a control of error which enables the child to self-correct without the need for an adult. There are specific materials designed for each area of the classroom. The Prepared Environment — Our classrooms are carefully prepared by the teachers to encourage independence, freedom within limits, and a sense of order. The child, through individual choice, makes use of what the environment offers to develop himself, interacting with the teacher when support and/or guidance is needed. The classrooms are designed to be child-centered with child-sized tables and chairs and easy access to materials. The materials are displayed beautifully on low shelves and are carefully arranged by the teacher. The classroom environments are neat and orderly with clearly defined areas for language, mathematics, practical life, sensorial, cultural subjects, and art. Uninterrupted 3-hour Work Period — Traditional schools follow tight, adult-led schedules. Beverly Montessori School offers long, uninterrupted work periods that allow children to fully engage in tasks they have chosen for themselves, under careful guidance of their teacher. Children have the opportunity to get fully-engaged in their work and experience states of deep concentration. Credentialed Montessori Teachers — Montessori teachers must complete a rigorous training from a MACTE (Montessori Accreditation Council for Teacher Education) accredited program to earn their Montessori teaching credential. MACTE is the international standard setting and accrediting body for Montessori teacher education. All the lead teachers at Beverly Montessori School hold a certification in Early Childhood learning from an accredited program. Affiliation –The American Montessori Society (AMS), American Montessori Internationale (AMI), and Association of Illinois Montessori Schools (AIMS) are the organizations charged with maintaining the quality and integrity of Montessori practice. Beverly Montessori School has been affiliated with the American Montessori Society since 1969 and are full members of the American Montessori Society and the Association of Illinois Montessori Schools.